Jose Pekerman announced the news to a press conference and the news is sure to damage Colombia's hopes at the tournament in Brazil. Falcao has been struggling since knee surgery in January picked up during a game for Monaco in the domestic cup. 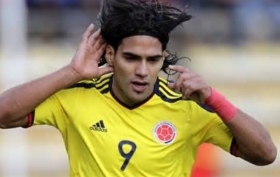 "We can say to all of Colombia that he did more than was within his power to play," said Pekerman. "He deserved the right for us to wait and keep the hope alive."